Connectors (idealistically those applicable to the Department of Defense) use singlemode and multimode fibers. The optical fiber and connector tested to MIL-PRF-49291 (General Specification for Optical Fiber) must have the capacity to transmit signals from a source to a destination while exposed to hazards of radiation and harsh climates in military and aerospace applications. 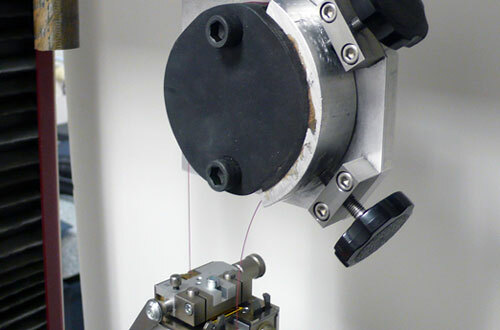 Test samples consist of singlemode and multimode optical fibers with three different combinations of composition of the fiber core and cladding. Testing rerquires a combination of conditions found in TIA-455-176 which measures the dimensions of the fiber. Fiber radii tested can range from 4.0 to 8.5 µm, 8.5 to 10 µm, 50/125 µm, 62.5/125 µm, 100/140 µm, 200/230 µm, and 400/430 µm. Different fiber sizes (as per their own slash sheet specification documents, 7 and 10 to 12) must be capable of transmitting signals with low levels of attenuation. Low level attenuation capability is tested to that of TIA-455-62 during the severe bending of the fiber; in MIL-PRF-49291 this test is called Macrobend Attenuation. During usage of any MIL connector while installed in the field of use, the mated pair may be exposed to harsh environments such as being severely bent (Macrobend Attenuation per TIA-455-62), radiated fields (Nuclear Radiation Resistance that tests the samples optical performance in a radiated area at ambient temperature per TIA/EIA-455-64), etc. The tests in MIL-PRF-49291 screen the fiber’s capability of transmitting proper levels of optical signals through the connector and at the same time is exposed to these harsh environments. Fibers are screened to the product dependant optical criteria based on fiber radius and type (singlemode and multimode).